The lowly lemon. Most of us use them regularly, but did you know that lemon and lime juice are very powerful in terms of health and healing in the body? Lemon juice is high in Vitamin C – 1/4 cup in fact contains 47% of the RDA of this health promoting vitamin. Vitamin C of course is necessary for optimal functioning of the immune system. That’s one reason why lemons have historically been prized by sailors and miner in remote places. Lemons and lime contain high levels of phytonutrient flavonoids called flavonol glycosides. These nutrients have antibiotic, disease fighting properties. For example, it has been seen in villages in Africa that the introduction of fresh lemon juice to the daily diet protects people against contracting cholera. Lemon and lime juice are rich in limonins. These phytonutrients are high in antioxidants, which slow cellular aging. Moreover, they have been linked to protection against the formation of cancer cells. Here are several ways that drinking fresh lemon juice can help the body to heal. Improving skin tone – lemon juice, with its high level of antioxidants and vitamin C supports healthy and glowing skin. Toothaches – fresh lemon juice, applied directly to the gums can reduce pain from toothaches. Sore Throat – gargling with a 50/50 mixture of lemon juice and water can eliminate a sore throat. Blood purification – lemon juice stimulates the production of bile in the liver and supports the cleansing of blood cells. Flushes bacteria from the body – lemon juice works as a diuretic to help the body get rid of pathogens. It is thought that this is why drinking lemon juice daily can help people with rheumatism. Losing weight – because of its cleansing properties, drinking fresh lemon juice can help reduce your weight. There is in fact a weight loss program called the “Master Cleanse” that uses a drink made from lemon juice. Depression – lemon juice and even the aroma of lemon peel is mood uplifting and can be used to help people overcome depression. Fever – lemon juice has been used traditionally to help break a fever. This is most likely due to its high content of vitamin C.
High blood pressure – drinking lemon juice holds some promise for reducing high blood pressure. All of the benefits above only relate to drinking fresh, unpasteurized lemon juice. That’s because bottled lemon juice, like the kind you can buy in the store in those little plastic lemons, has been heated to high temperatures and exposed to preservatives that effectively destroy its delicate nutritional properties. 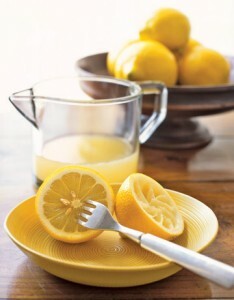 It’s always best to use only fresh raw lemon juice. Beyond that most doctors recommend that we eat a high percentage of our diet in the form of fresh raw food. Using fresh lemon juice for health and healing is really simple actually. Simply juice 1-3 tablespoons of lemon or lime juice and mix it in with a cup of water. You can also add a touch of honey if you like to improve the taste. Although you can drink lemon water throughout the day, it’s important to drink it first thing in the morning before consuming anything else as well. The reason for this is that lemon juice will alkalize your stomach and kick start your liver into functioning. Both of these tasks are harder if you’ve already eaten. Get yourself some fresh lemons or limes and start juicing and enjoying. And for quick and massive health results from using lemon juice, check out Master Cleanse Secrets. Previous post: Step Into The Future With Unexplainable Store?